Your kitchen is most likely one of the most used rooms in your home. And since it’s where your food is stored and prepared daily, it also requires the most cleaning. While your kitchen appliances require periodic deep cleaning, the rest of your kitchen surfaces require cleaning just about daily. Tip: Run your sponges through the dishwasher or put them in the microwave while damp for a quick freshen up. Cabinet doors are prone to dirt, bacteria and grease, especially the ones you use most often. Most surfaces can be wiped clean with a diluted grease-cutting dish soap or laundry detergent. For areas with tough stains, try a paste made with water and baking soda. Apply the paste to a wet towel and gently scrub the stain. Your range hood collects grease and dust, more if you use it often. Wipe down the exterior with a damp cloth and a degreaser. You’ll need to clean the hoods filter and interior depending on how often you run the vent fan. The filters remove easily and they can be soaked in warm water and a degreaser to loosen trapped grease. Pop out the filter, rinse it with the faucet sprayer, shake off excess water and allow it to air dry. Wipe out the interior of the hood with a rag dipped in water and a degreaser. Rinse often. Towel dry the interior and replace the filters. Tip: You may be tempted to run the filters through your dishwasher but the grease may clog your dishwasher’s drain. The backsplash is the area behind your stove that has a quite literal name - it catches food that splashes up during preparation or cooking. A little dish soap and water will work for most surfaces. Choosing a product that dissolves grease will help remove the tougher grime that can build up behind the stove. 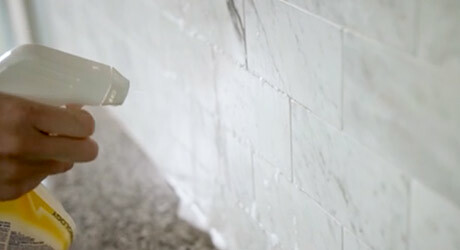 This is especially important for tile backsplashes, where grime builds up along the grout lines. Choose a product specialty formulated for cleaning and brightening tile grout, or you can mix a water, soap and basking soda solution. A grout brush will help remove tough stains and caked-on food. Tip: A grout brush also helps clean tight corners and edges around the kitchen. Keep your countertops clean and sanitized, especially after each time you prepare a meal. For laminate countertops, simply use a sponge and dishwashing soap. Avoid using bleach or acidic cleaners, these can permanently discolor the surface. Try using a toothbrush in the hard to reach crevices and along metallic seams. Rinse with damp cloth and towel dry. If you have a non-porous countertop surface such as corian, avoid using abrasive cleaners that can scratch the surface. Best to clean with a towel or sponge.Keep your countertops clean and sanitized, especially after each time you prepare a meal. Your kitchen sink can be a breeding ground for bacteria so clean it pretty often. For most surfaces a mild soap and a sponge will be all you need, but a household cleaner or even glass cleaner will also work. Sprinkle on some baking soda to help remove odors, hard water stains, and grease. Avoid using harsh chemicals and abrasive cleaners like steel wool or wire brushes on acrylic, cast iron, or granite composite sinks. These will scratch the surface. Give your garbage disposal some ice to crush, it will loosen food residue from the blades. Add a few tablespoons of baking soda to remove odors. Rinse with hot water.Your kitchen sink can be a breeding ground for bacteria so clean it pretty often. Sweep your kitchen floor every day to stop dust and grime from building up. 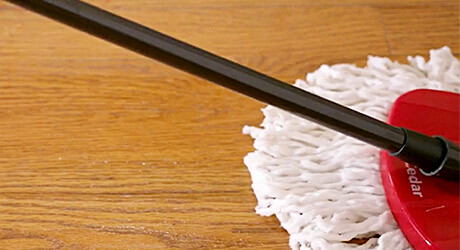 Best to sweep before you mop to prevent scratching the surface. A damp mop and a little dish soap is usually all it takes for tile and vinyl.Sweep your kitchen floor every day to stop dust and grime from building up.